The thought of tucking into a plate full of comfort food is quite appealing at any time of year, especially during winter. Apparently we here in the DC area have an appetite for hearty simple dishes as evidenced by the immense popularity of such restaurants as Brasserie Beck and Central as well as the perrenial Bistro D'oc, Montsouris and Montmartre on the Hill. I would like to bring some bistro favorites to your table and from time to time, will share a bistro meal from my home to yours. For me, the goal is to make bistro food accessible both in terms of easy preparation and affordablity. This meal for four can come together in about an hour and involves no work ahead of time. Spatchcocking, or butterflying the chicken expidites cooking at high roasting temperatures. 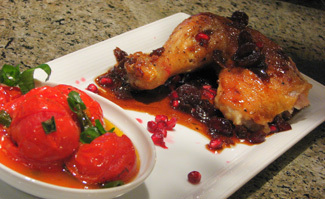 The tomatoes roast quickly and cooking overlaps with the chicken at the same oven temperature. The fries take only minutes to get crisp and slightly browned using a twiced-fried method. I hope you enjoy the tastes of this meal, from the juicy chicken with a sweet yet sharp sauce to the nutty salted topping to the rich tomatoes which have been concentrated by oven roasting. 4 green onions- white and green parts chopped 1/2 inch. Melt 2 tablespoons butter in saucepan. Add shallots and cook until translucent, about 3-4 minutes. Add balsamic vinegar, maple syrup, several grinds of pepper, cinnamon, chicken broth and cranberries. Simmer over medium heat until cranberries are plump, about 5-7 minutes. Add salt to taste. Set aside until chicken is done. Generously salt and pepper chicken on both sides. Heat 2 tablespoons of vegetable oil in an oven safe pan/roasting pan. Place chicken skin side down and sear for 2 minutes, making sure that oil coats the bottom surface of the chicken for even browning. Transfer the chicken to oven and roast for 15 minutes. Turn chicken breast side up and continue to roast for an additional 15-20 minutes or until juices from thigh run clear when pricked (internal thigh temperature is recommended to be at 165 degrees). Set chicken on a platter (allow to rest for 10 minutes) and discard all but 2 tablespoons of pan drippings. Pour balsamic sauce into pan and heat on high for 2-3 minutes allowing sauce to reduce and thicken. Cut chicken into serving portions and spoon sauce over chicken. Top with melted butter with pistachios. Sprinkle pomegrante seeds to taste. While chicken is resting, place 2 tablespoons butter into a small saucepan. Melt over medium heat. Add pistachios and cook for 2 minutes. 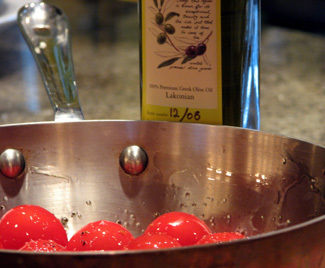 Place tomatoes in oven safe dish and add 2 tablespoons olive oil,marjoram, oregano salt and pepper. Toss to coat. Place tomatoes in oven 5 minutes before chicken is done. Roast for 10 minutes, stirring occastionally. Add green onions and continue roasting 5 minutes. The tomatoes will be done just as the chicken is finished resting. As the chicken is resting and tomatoes are finishing in the oven, bring about 3 inches of a light oil (vegetable,peanut) to 325 degrees in a heavy bottom pan. Fry sweet potatoes for 4-5 minutes to cook through. The potatoes should be limp but not take on any color yet. Remove fries from oil and drain on paper. Increase oil temperature to 375 degrees. Place the fries back in the oil for an additional 1-2 minutes until they brown a bit on the outside. Drain fries on paper. Immediately dust with a pinch of cumin and kosher salt. Seriously, this sounds so good that I didn't have to read anything past the title! Thanks for this. I am going to try it this weekend! 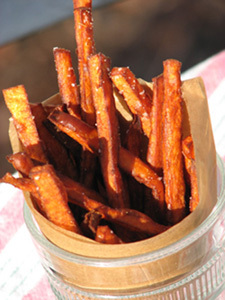 I'm obsessed with sweet potato fries lately. What about a brown sugar sauce to top them off? Taresa, brown sugar goes really well with sweet potatoes, especially in soufles etc. I could see dissolving brown sugar in melted butter and pouring it over very crisp and hot fries, and served immediately.